Beautiful oil on panel mahogany signed c. Manago, in a golden frame in very good condition (a small accident in the upper right corner). 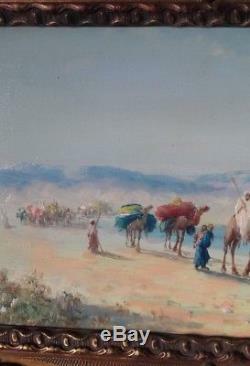 Caravan in the desert approaching an oasis. Light and subtle impastos, a beautiful light, a beautiful landscape of oases and dunes in the background, a superb perspective. 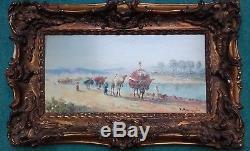 Panel dimensions: 41 cm W x 21 cm h. Dimensions with frame: 46 cm x 34 cm x 6.5 cm (depth). Preferences for payment: transfer or check. Vincentmanago was born in Toulon, France in 1880. 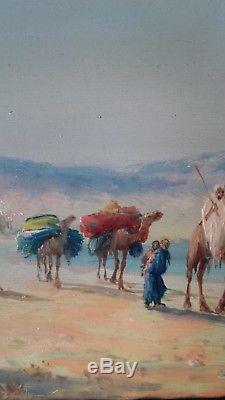 He emigrated to North Africa then Enfrance and painted landscapes and street scenes. 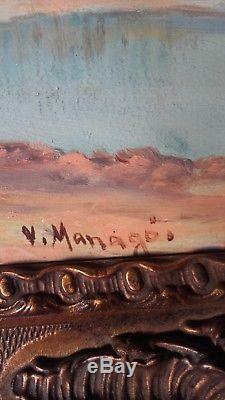 Vincentmanago was a very popular painter in Marseille between 1900 and 1913, where his work was presented at the international fair of Marseille and the colonial exhibition of the countries of Africa and Provence. The Mediterranean coast (martigues harbor, la rochelle, venice) and dansla. The latter showed the influence of sesjour in Tunisia and Algeria on his art. He used bright colors in his paintings. 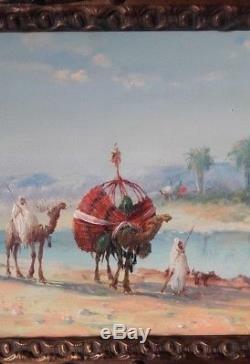 Like other Orientalist artists, he was also inspired by scenes depicted on postcards. A postcard, black woman kneading the cake in the collection. Librairie d'amico, tunis was used to paint in 1903 a street scene in which a young woman sorts grains into a bowl. At least four different versions of this painting have been made, including one at the Museum of Fine Arts. In addition to being a painter, manago also worked as a decorator in several private residences in tunis and alger. His eldest son, dominique manago, born in Tunis in 1902, also became a painter. Vincent manago lived until his death on June 30, 1936. 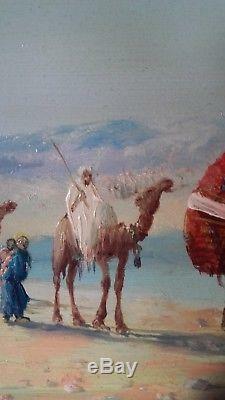 The item "oil on panel signed v manago caravan in the desert" is on sale since Saturday, November 10, 2018. 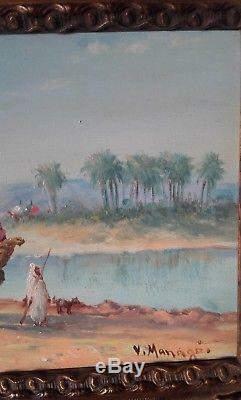 It is in the category "art, antiquities \ art of the nineteenth and before \ paintings, enamels ". The seller is "toinon" and is located in marolles braults. This item can be shipped to the following country: european union.